Dondorf's Patience-Karte Vier-Erdteile (Four Continents Patience) was first published in c.1870 with square-cut corners, no borders and no indices. This edition has rounded corners, border lines and small indices, and was published in c.1910. As in the full-sized pack of the same name, each suit sign is assigned to a continent: Clubs represent Africa, Hearts Europe, Spades Asia and Diamonds represent America. The four Aces each have two landscape scenes from their corresponding part of the world. The Ace of Clubs shows coconut palms and Lake Moeris (Egypt); on Hearts we see an Italian forest and a German medieval castle; Spades the Great Wall of China and Indian palms; on Diamonds the Niagara Falls and South American Pampas. See also: Four Continents • Kinder-Karte Patience No.25. 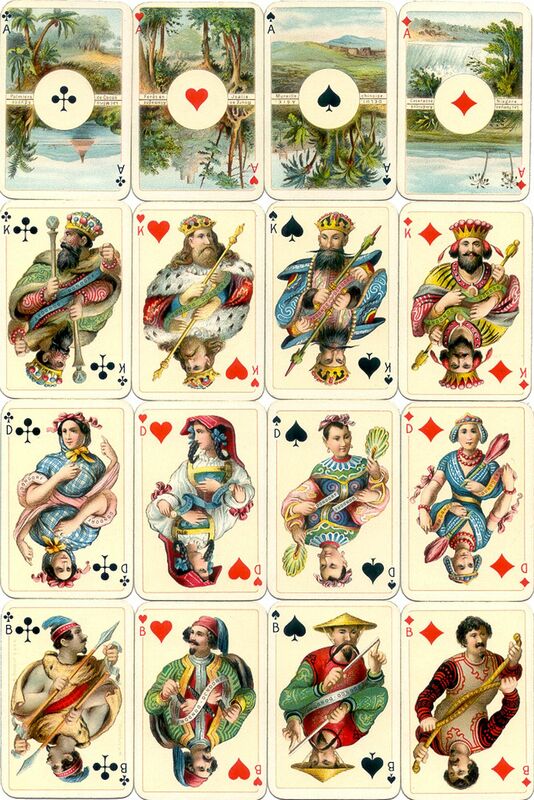 Above: Aces and court cards from Dondorf's 'Four Continents' Patience, chromolithography, with rounded corners and borders, after 1906. The court cards depict stereotyped persons from each of the Four Continents. In this edition the captions on the four Aces are in French but versions with German captions were also produced. 52 cards; 64mm x 43mm. Images courtesy Barney Townshend.